2019 update: I really wish I could help everyone who is having issues with the sleeves on the Father Pullover Sweater, but it’s been a while since I made it and I can’t remember what I did, expect that it looked confusing but still worked out in the end. Many people have chimed in so please check out the comments and see if there is a solution to your problem. If not, please feel free to post it and I will try to research for you. I finally completed my first wearable that is not a hat or scarf. I felt adventurous and ready to tackle a pattern for a crocheted mens sweater. Originally I had planned to make the Tip Top Sweater from Interweave (affiliate purchase link) for dear hubby, but when the time came to put this project on my hook I didn’t have the funds for that much DK yarn. I had a ton of Brava Worsted so I looked around for a worsted weight sweater and found the Father Pullover by Red Heart (aka the Simple Sweater for Him on All Free Crochet). This project schooled me a bit so I’m sharing my notes and thoughts with takeaway ideas in bold. This pattern uses all hdc (half double crochet) in vertical rows. The effect is to give the rows a striped look. I’m not loving this and think I would avoid all hdc. I may alter it to use the griddle stitch if I make this again. The striped effect also made it harder to sew up, as the rows on the back and front of the sweater needed to be lined up exactly. I used KP Brava worsted in Umber, which is a really pretty dark brown. I bought tons of it for a cabled blanket only to realize that dark colored yarn is not the best yarn to do cables in. I couldn’t see what I was doing. It was the same way sewing up the pieces of this sweater and I would probably not chose a dark yarn for another sweater until I felt more experienced. For a sweater, medium-weight yarn is heavy! I made it in men’s XL, but feel that the worsted weight yarn added to the effect that this sweater looks a bit big. I would go with a pattern calling for a DK yarn next time. The Father Pullover pattern itself can be confusing and I needed to head to the net for help a few times. Everyone and their mother has problems with the way the sleeves are written, and I saw a few people who had resorted to writing their own sleeve pattern. It’s really easy to miss that the pattern says to increase on both ends of the sleeves. 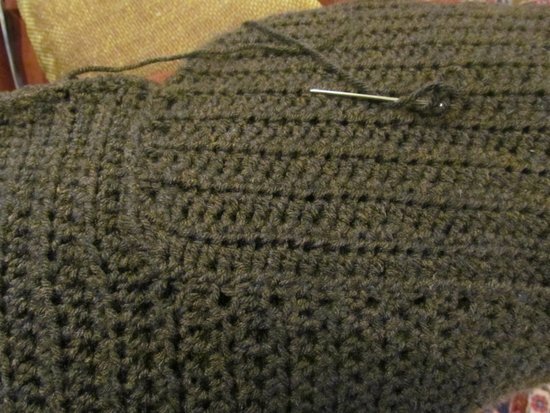 So you are adding 2 stitches per row – one stitch to either end, not increase only 1 as it seems to say as it’s easy to miss the word BOTH. The pattern also calls for counting the turning chain of each row as the first hdc and skipping the first stitch. Skipping the first stitch made huge holes at the beginning of each row and it looks horrible. I’m not skipping next time, instead I will use the Foundation Turning Stitch I recently discovered. I experimented with leaving long tails on the yarn to use them to sew up the pieces. This worked ok but was a little messy when there were lots of them and I didn’t know which ones I’d be using. Overall, I’m pleased with the results for a first project. It’s very warm and I’m happy to see dh in it, even the striped look is growing on me. I would just consider the things I learned here for a next time. Did you make this sweater? I’m not an expert, so I’d love feedback on my tips and thoughts. Let me know in the comments section below. I am going to make this cardigan for my husband. And your tips will definitely help me. Thanks ? Anyone having trouble with joining the sleeves, roeallen 12 has great picture on ravelry. The sleeves!!!! going to drive me insane! This pattern has tried every nerve and i am not a novice!! i cant get the stitch count to come out correct on the sleeves! Any suggestions?? Thanks for the help. I too was struggling with the sleeves. I have the pattern downloaded direct from the Red Heart website in front of me right now, and nowhere does it say the word “both” when speaking of increasing by 1 stitch at the end of each row. It’s not that it’s easy to miss the word – it’s that the word isn’t there at all. The pattern clearly has an error in that it says to only increase on one end of every other row. The pattern for the BACK has you shaping armholes after your piece reaches 16″. But when reading the pattern for the FRONT, there is no instruction for the armholes and the pattern instructs you to “Work same as back until piece measures 22½” You then start shaping the armholes almost 12″ higher than you did on the BACK. Anyone who’s made this: did you shape armholes on both pieces or just the front? Hi Rachael, I’m just copying the reply I sent you in email in hopes that it can help someone else too. you’re right it’s been awhile since I made this sweater, but your dilemma is ringing a bell. I remember being confused by this but did the pattern as written. It ended up working out fine without tweaks. I think given the shape of a man’s back the shaping many happens in the back panel. ONe thing I would say you can do is look on the Ravelry project page for the pattern and see if anyone made changes. https://www.ravelry.com/patterns/library/father-pullover/people I hope this helps and the sweater ends up being fun for you to make. Someone who has made this sweater previously answered my question and I wanted to pass it along in case any of you try to make this pattern in the future. For the Front of the sweater you work the pattern to 16.5″, then start the arm holes (just as on the Back) until the piece measures 22″ (or longer depending on the size you’re making), then continue with the pattern for the Front and begin shaping the shoulder. This should end up with both pieces being relatively the same size (the Front will be 2″ shorter than the back +/-). Hi! This is the first sweater I’ve ever made and I’m also having a very hard time understanding the pattern. I had to adjust the length by taking 2″ off the total length so it will fit my husband properly (I’m making the sweater according to the size medium measurements and the only thing I adjusted was the length). I finished the back piece with no issues but now I’m starting the front piece and I’m REALLY confused. The way I’m reading the instructions would have the left and right shoulder shaping starting way above the shoulder shaping for the back piece……..maybe it’s just my inexperience but that somehow does not seem right. Can someone help me please? I’m really sorry for seeing this so late. My site is not sending my comment notifications and I need to fix that. I’m thinking as long as you adjusted the length on the bottom and not the top, then this is right as the back needs to spread out a bit more. Are you still stuck? When ever I am working a flat piece such as this, I always make a hdc2tog in the very first stitch and the stitch you would use as your first working stitch. 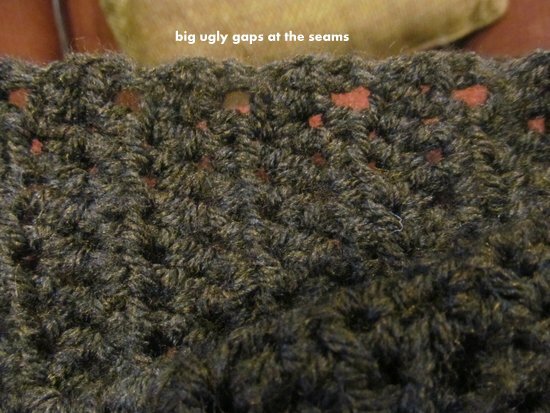 That way you’re not increasing your stitch count, but you are filling in that ugly hole so it isn’t there. This works also for DC or TRC as well. Thank you for your notes. I am making this for my hubby. I have made baby sweaters before where the increase is on both sides of the sleeve, and it is very easy to miss that point in the instructions. You have made me Aware so I’ve circled that part on my sheet so I don’t do that like I have with baby sweaters. Your sweater looks great. I usually don’t like the striping effect hdc gives to sweaters, buy for some reason I really like it on this particular sweater. This is the first sweater I’ve ever attempted to make, and I’m having trouble getting out of the starting gate. Is this pattern crocheted in the round or in rows that make pieces that you eventually sew together? Hi, Megan! This seems to be a popular first sweater. It is made in separate pieces that get sewn together. Thank you Thank you! I am currently working on this pattern and it is my first sweater. I have redone a sleeve 3 times and couldn’t figure out why it looked so weird. I will do it right now! Thank you! Wonderful, very happy you found my journey with this sweater useful. I hope the sleeve is not a headache anymore. Enjoy! Thank you soooo much for the idea of using the Girdle stitch instead of the hdc rows!! I loved the style of this sweater, but hated the stripes! Awesome! I’m glad you like the suggestion and can’t wait to see how it comes out. I checked out 3 differnet tutorials on the web for turning chain alternatives and the easiest by far is on crocheteverafter.com “How to Eliminate the Gaps from Turning Chains Tutorial”. Of course that’s purely a personal preference but I’m using it on the pullover now and the technique looks much better than the 2-chain turn. I checked out the sleeve increases at each end and I’m glad you pointed them out; I may have missed that. Here we go! I’m working on the back so I just started this sweater and I noticed the gaping holes too. I hope my brother-in-law can overlook them. I’ll use your tip on the foundation turning stitch for the rest. My big fear is setting in the sleeves. I’ve looked on the net but nothing seemed very clear. I wish someone had a video tutorial on indenting sleeves! I’ve never made a man’s sweater before…I think you did a fabulous job UmmiZu with your first attempt. Thank you, I’m so glad you found my tips useful! I think as long as you line everything up right, you should be fine. You can always take it out if it seems a little wonky. I’m planning to make this sweater for my hubby, thanks for the tips! I’m so glad I found your post. Thank you for postig pictures of the sweater and joining pieces. I am attempting this as my first big crochet project, an adult can wear. 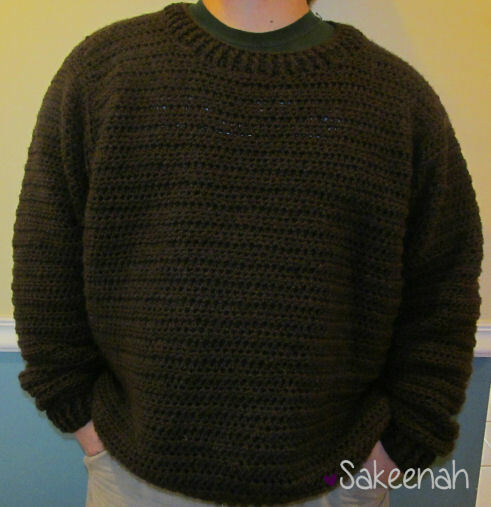 I fund it hard to find a pullover pattern for a guy sweater in crochet. 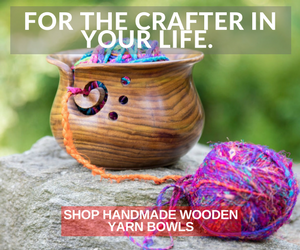 When I found this I went and bought the yarn and also picked a brown color from what I saw at the store it was what I liked best. My first choice in color was on short supply at the store. I liked reading your tips and will apply them, especially about the gaping. I noticed that when I made the swatch. If I get stuck, I may need to come back and ask you! Hi, Mari! I’m so glad you found this useful. Smart to make a swatch. I wish I had done that. Please do come back if you need help. I will try my very best to help you. You did a good job with it. I would like to learn to crochet a pretty sweater for one of my girls. This is great! I think it’s awesome that you were able to stick with it and finish even after finding some things you didn’t really like about the pattern. I think it came out looking awesome! Thanks so much! It took a lot of patience. Looking forward to making a sweater for me this time, hopefully with DK yarn.